The most recently released trailer shown for Team Sonic Racing really showed how much the game had improved thanks to its delay. Now, the game is a serious contender for a racer that will really excite and engage. This new trailer shows off some never-before-seen footage of new tracks. Team Sonic Racing tears up the track on May 21st. SuperPhillip Central's featured game of the month. SuperPhillip Central was feeling good for the month of March with eight reviews posted on the site in that time span. Not just feeling good because of the warmer temperatures and arrival of spring, but also because developer Good Feel saw two of its titles featured this past month. Let's explore those games and the other titles reviewed last month with the Review Round-Up for March 2019! We started out with an edge, though, with Travis Strikes Again: No More Heroes (C+) and Hell Warders (C). But then, we turned to more colorful romps with Monster Boy and the Cursed Kingdom, a game that astonished and amazed with its quality (and a game I would have given an SPC Best of 2018 nod if I had played it earlier than this past month). The game received an A-. We continued to get colorful with Kirby's Extra Epic Yarn, Good Feel's first of two featured games this month. It knitted its way to a B. Two other games received the same B grade, and those were Assault Android Cactus+ and Trials Rising. We then returned to some platforming action of the more typical type (rather than riding on and trying to stay on bikes) with Shantae: Half-Genie Hero (B+) and SPC's featured game of the month, Yoshi's Crafted World. The latter was the other game of Good Feel spotlighted last month. 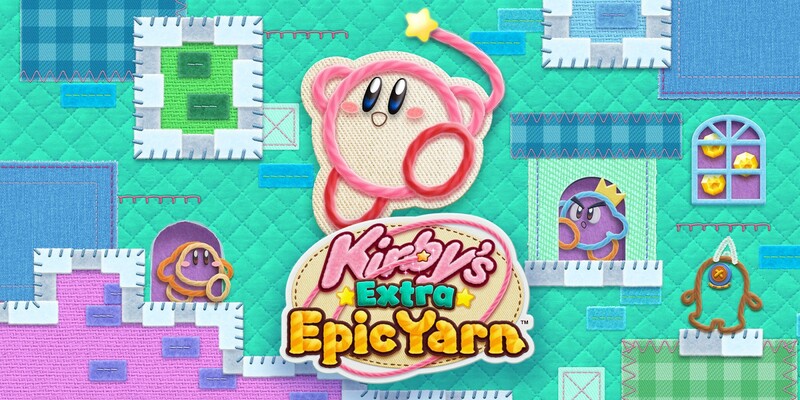 version of his first Wii romp in the form of Kirby's Extra Epic Yarn. 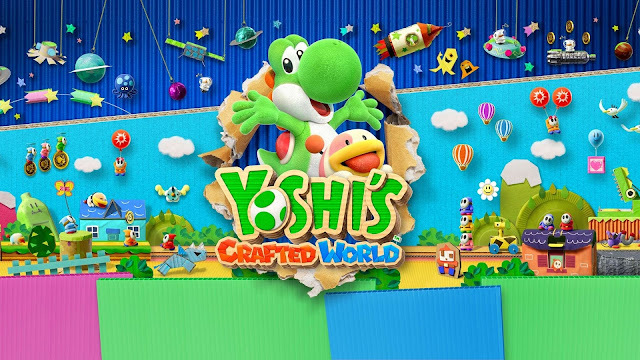 SuperPhillip Central closes out the month of March with a review of a recent release, Yoshi's Crafted World for the Nintendo Switch. 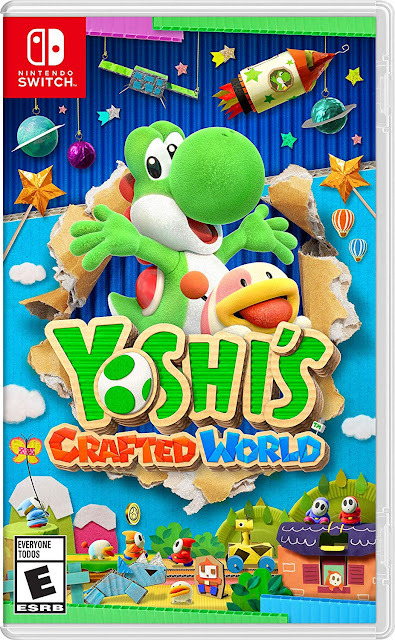 As someone who adored Yoshi's Woolly World and obviously Yoshi's Island, how does Crafted World fare in comparison? The answer's in the SPC review! Yoshi debuted in North America in 1991's Super Mario World, and ever since, the green dinosaur has been a major part of the Mario universe. His popularity granted him his own line of games, beginning with 1995's Yoshi's Island. Since then, Yoshi's series of games have had more ups and downs than a roller coaster, with some being of considerable quality while others being major disappointments. Depending on who you ask, perhaps all of them since Yoshi's Island have been disappointments. 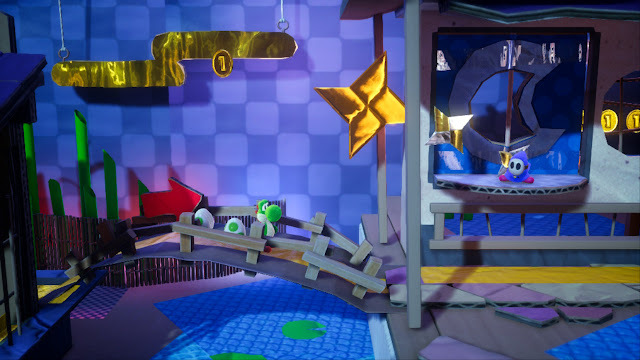 Yoshi's Crafted World is the latest game starring the Yoshi clan, and with it, it brings an exhaustive amount of creativity in its visual style and art direction, but is there more appeal in Yoshi's Crafted World than just on the crafty surface? Before getting into that, I immediately noticed just how much of a visual delight Yoshi's Crafted World is. The game world is like a child's arts and crafts project--well, a child who's much more gifted than I was at that age (or maybe ever). I enjoyed the slow and methodical pace I had to use in order to find all of a level's collectibles because it allowed me to really appreciate and study the creative crafty concoctions on display. Everything from background hills and mountains being made up of green paper plates and grass crudely created out of construction paper in the first level of the game to the straw bamboo shoots in the Japanese-themed castle display such a clever art design that truly astounds and is a terrific treat. 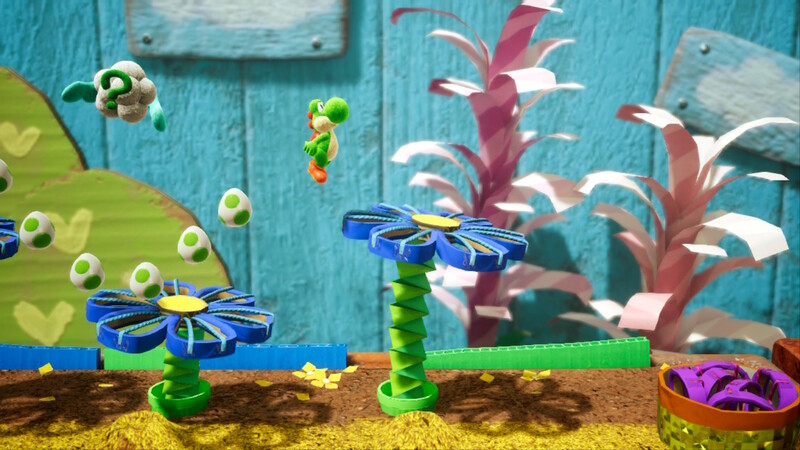 Yoshi uses some flower power to progress through this early game level. Levels have a front side and a flipped side, where you run through the same level, but you start at the goal and work your way to the start. You're still going left to right, but this time the camera is facing what was once the foreground of the level. I loved seeing things in the flipped version of levels that I couldn't notice when playing them in their original form. Such things were like Shy Guys napping in alcoves, platforms comprised of empty cereal boxes, complete with legible bar codes, and the child-like scribblings on the back of cardboard walls. 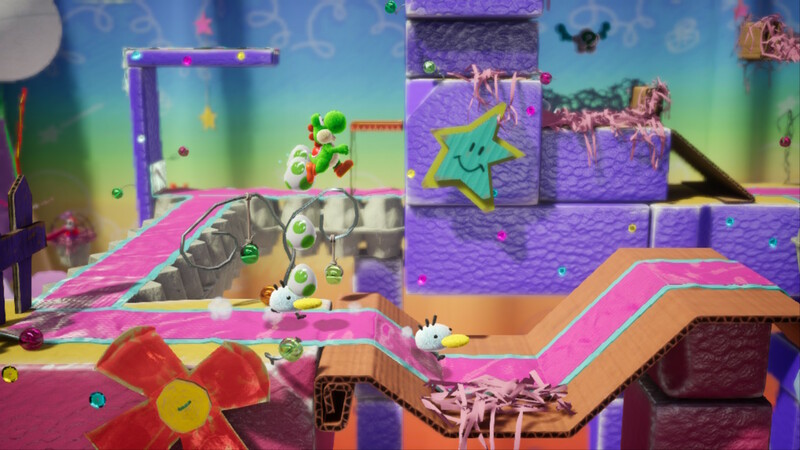 It's in these flipped levels that Yoshi must find and nab three of longtime pooch companion Poochy's three pups which are hiding in the flipped version of the game's 43 main levels. They aren't too terribly tough to find, as the pups not only bark when you're nearby them, but the Switch Joy-Cons or Pro Controller also vibrates as well in the pups' vicinity. The only real difficulty to these missions is gathering all three pups and reaching the goal in the level's time limit to earn a bonus collectible. Speaking of difficulty, Yoshi's Crafted World isn't going to challenge most seasoned players of platformers... at least for the most part. If you're simply running through levels to reach the goal of each course, you're going to find the game to be a breeze. At the same token, you'll also be depriving yourself of being able to appreciate the level designs, not just with the aforementioned creativity in the arts and crafts design that permeates throughout the courses, but also in appreciating how well hidden secrets are. Lastly, and most importantly, you'll create roadblocks for yourself in advancing in the game. You'll be sure to get dino-"sore" if you get rammed by that triceratops, Yoshi. 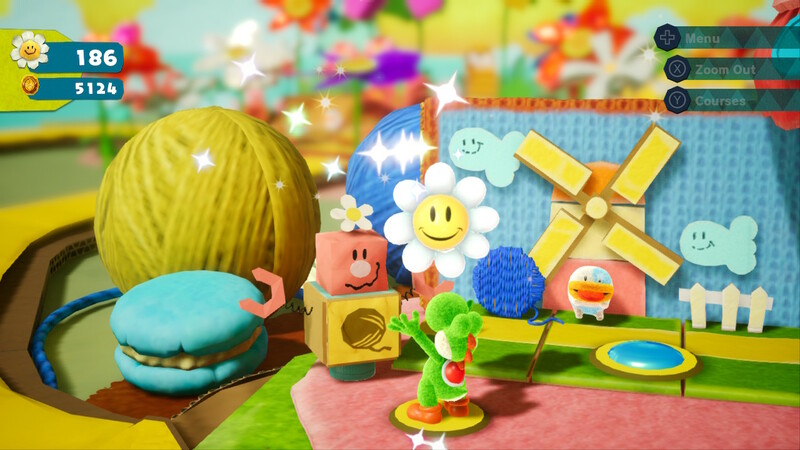 Throughout the world map, there are characters that require a set number of Smiley Flowers, one of the main collectibles within Yoshi's Crafted World. Once you give them their required amount of Flowers, you're able to advance forward in the game. These Flower goals don't require much of a grind at all, just a small amount of exploring levels to acquire the sufficient number necessary to progress on the world map. Thus, these Smiley Flower roadblocks make it so that exploring these deviously and cleverly created levels is encouraged, and not so much so that you have to comb every inch of level for hidden goodies. Just like your typical Yoshi game hearkening back to the original Yoshi's Island on the Super Nintendo, Yoshi's Crafted World has several collectibles, but it works a little differently than past games. For one, there are a multitude of Smiley Flowers to earn in levels. This isn't just from discovering them in item clouds (rather hidden from sight or not) or placed in precarious locations, but also from achieving certain goals in levels, which are always the same in each level. Levels also move between the background and foreground, adding even more impressive visual variety to the game. These goals task you with collecting 100 coins or more, having full health at the end of the level (which is made easier by the unlockable but completely optional cardboard costumes you can earn in-game--as these add extra hits to Yoshi), and finding all 20 red coins. Each goal you complete nets you a Smiley Flower, yet another way to make progress in Yoshi's Crafted World. Unlike Yoshi's Island, you need not get 100% in a level all in one go. Your progress in each level completed is saved, so if you collected 19 of 20 red coins in a level, you'll only need to find that last red coin missing instead of having to collect all 20 all over again. 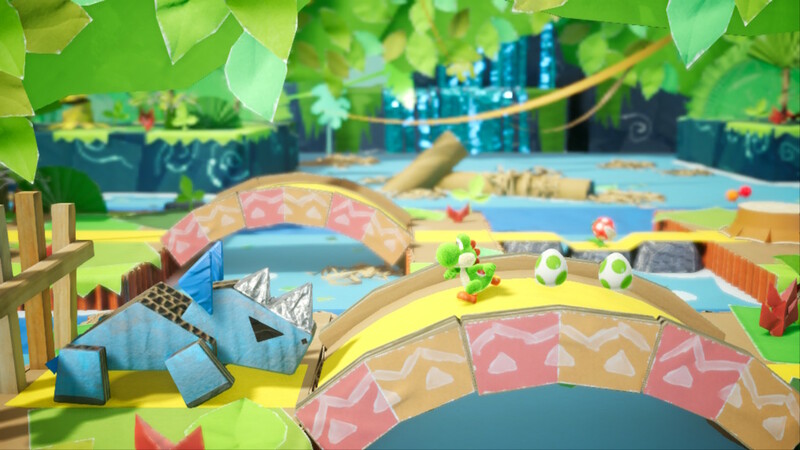 And it's especially fortunate that you don't have to collect everything in one play-through of a level, as part of the actual challenge in Yoshi's Crafted World comes from merely finding and acquiring these hidden and out-of-the-way collectibles. Some are truly fiendishly placed, requiring keen observation and a little platforming prowess as well to find and collect. It was just another way Yoshi's Crafted World amazed me with its levels. A new gameplay mechanic in Yoshi's Crafted World allows Yoshi to aim his eggs in the foreground and background. Thus, you have a whole new series of places where items can be placed, and this is particularly notable with Crafted World's series of souvenirs to find. Characters on the world map will ask of you to find and hit with your eggs certain souvenirs from levels. Thankfully, you don't have to wonder which level houses what souvenir, as these are clearly marked on the level they're present in. What I'm not so thankful about is how many times you have to return to levels just to collect souvenirs. While this isn't at all required to reach the end of the game, souvenir hunting means you enter a level, scour it for the souvenir or series of souvenirs, hit them with eggs, and exit the level to give said souvenirs to the character who asked for them. Smiley Flowers like this serve as currency to open new areas in Yoshi's Crafted World. This means entering a level and sometimes having to play through the most of it due to a given souvenir being located near the level's end (a pain for levels that have a set pace such as auto-scrolling levels, where you can't just quickly rush through them), and doing this for each and every souvenir in the game. There are a LOT of these--sometimes up to ten per game area on the world map, and although it's nice you can exit a level once you collect the required souvenirs, it can absolutely bog Yoshi's Crafted World's pace down considerably. Thus, instead of doing these all at once, I found it less of a hassle to acquire souvenirs as I was doing other goals. So, if I was missing a collectible in a level, I'd kill two Goonie Birds with one egg and search for the missing collectibles while also searching for the souvenirs. I'd do the same thing for the Poochy Pup missions, but I still needed to return to levels multiple times regardless. Most importantly, though, my advice is to not try to get 100% in each area of the world map before moving on to the next. 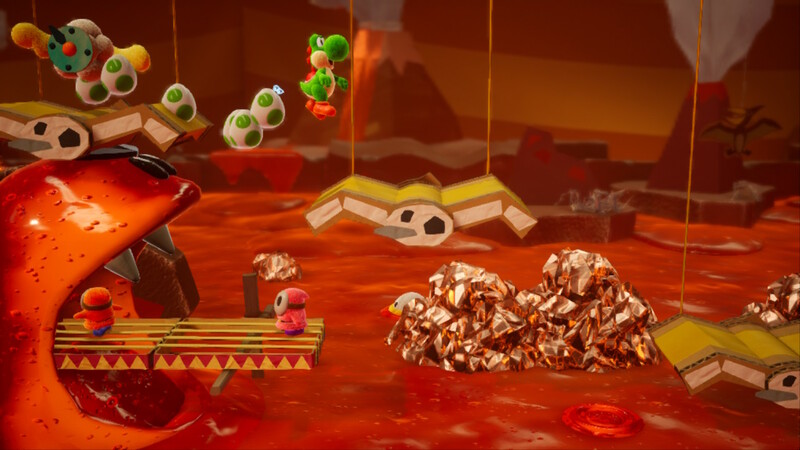 You'll burn yourself out quickly on Crafted World if you do, as no amount of creativity in the level design will make up for having to revisit the same level for the umpteenth time as you search for yet another souvenir. Again, though, thankfully the souvenirs are mostly optional content, and even still, the 100% reward is more about the journey than the destination. Souvenirs such as these gold ninja stars can hide anywhere, so be on the lookout! Another thing I appreciate about Yoshi's Crafted World is eschewing the long-running tradition of Yoshi's Island-themed games of having eight levels per world. Instead, Yoshi's Crafted World splits up the levels between a plethora of areas and zones, usually consisting of two to three similar themed levels. Once you beat the first boss of the game and collect its gem, the world map greatly expands, allowing you multiple pathways that branch out considerably as you search for the next three gems. Furthermore, the levels allow for a type of locale and theme before quickly moving on to the next, meaning no one idea lingers for too long. 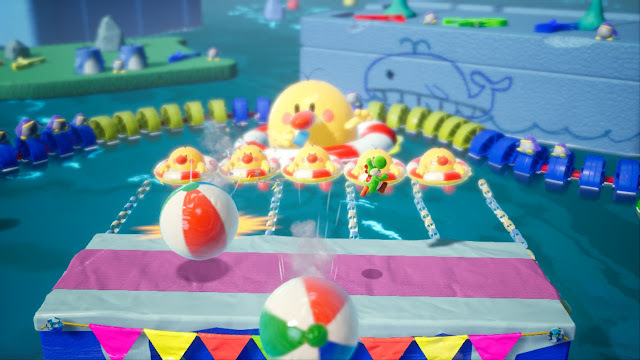 Sure, you have your typical grasslands, beaches, glaciers, forest, and such which are standard platforming level tropes of Nintendo games, but Yoshi's Crafted World also breaks away from that template. There are haunted houses with one of them that features crazed clowns with "axes" that chase poor Yoshi through them with little time to relax, circuses with literal hoops to jump through, river rides that take place aboard cardboard lilypads that are set in a bathroom interior, and even a level with low gravity in a crafted diorama of outer space. There also atypical levels that forgo platforming for vehicle-based romps, such as riding on a plane, on a solar-powered car, and even in a Yoshi-shaped robot. Every object in the environment is made up of crafty components, such as these lilypads made of sponge and cardboard. There's no real reason to re-face these bosses... until you reach the post-game, that is! If you're looking for a superb-looking Switch game--heck, just a superb-looking game, in general--then Yoshi's Crafted World will definitely delight. Everything from the plush-like softness of Yoshi's character model to the way the background comes into focus when Yoshi aims an egg back in the far distance makes for a stunning display. Performance on the Switch in docked form is fantastic with crisp colors, defined edges, and stellar textures. Things aren't so great in handheld play, but serviceable enough. There's just the issue of the game in handheld play looking awfully blurry in comparison to docked form. Additionally, on the presentation side of Yoshi's Crafted World, the music is probably the most disappointing feature in the game. While the compositions are well done, the instrumentation uses a classroom instrument-like sound, which is very low energy and not too exciting. Plus, we have a Yoshi's New Island situation where the main theme is used immensely throughout the game, just with different instruments and in different keys here and there. It's okay that Shy Guys are on this Blarrg's diet--they're Keto-friendly. Yoshi's Crafted World is the type of game that is like a cozy bed. You just want to put your face into its adorable pillows, feel all warm and fuzzy under its creative covers, and take a relaxing and rejuvenating rest in. Or it's like a cute doll. You just want to hold it and squeeze it until its saccharine sweet cuteness just pours out. 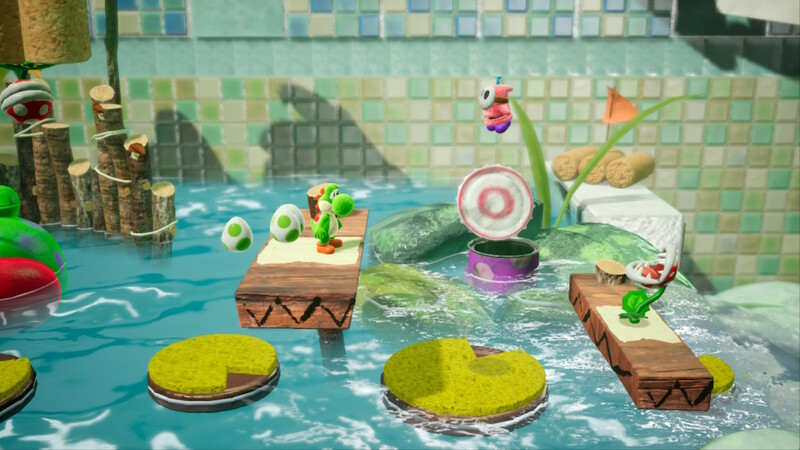 Whichever simile you prefer, Yoshi's Crafted World delivers a lovely and endearing game with sensational levels--some of the best Yoshi has ever been able to run and jump in--accessible mechanics for all ages (making it so Yoshi automatically makes an egg when an enemy is tongued up without needing to press down is a much welcome addition), and stunning arts and crafts environments. Although the challenge level isn't high or punishing, there's enough here content-wise to last most players a long time regardless, especially if you're gunning for 100% completion.